It’s one thing for Donald Trump to have plans for the country that we disagree with, but it’s pretty offensive that he insists on lying about them, too. This week, Trump said that border wall construction had started in California via a tweet, complete with pictures of a wall and forklifts and workers in hard hats. It looked like things were really being built and money was just flowing through the economy. It was a way for the president to pretend that his notorious border wall, which was the genius policy idea that kicked off his campaign to begin with, was actually happening. But the pictures of the wall being built on his Twitter feed are akin to someone taking a selfie of themselves reading Proust in its original French to look smart, but the book is upside down. There was nothing true or real about the context of the pictures the president shared. It was, in the president’s own words, fake news. 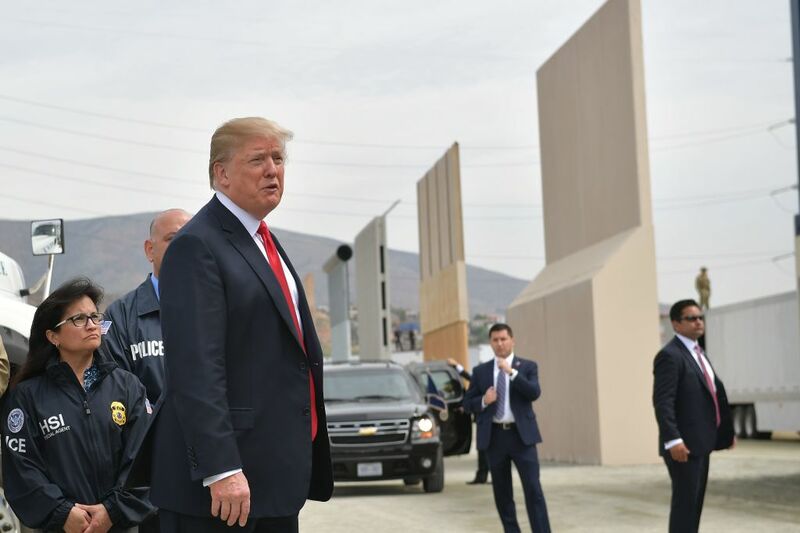 “Although the existing wall has proven effective at deterring unlawful cross border activity, smuggling organizations damaged and breached this outdated version of a border wall several hundred times during the last two years,” the agency said, according to the New York Post. Yet, Trump supporters are acting like this is a new project Trump started and that it has something to do with his famous pet project. It would be sort of embarrassing, if the implications of a president knowingly misleading the public weren’t so infuriating and scary. The only other reason for these tweets is that an aide lied to Trump and pretended this was a new thing, which just…can’t be true. Can it? We don’t know what’s real anymore. Life in 2018, guys. Listen, we get why he feels like he needs to drum up excitement about this wall and make it look like he’s actually accomplishing something. It’s because he’s really, really not getting anything done, and that’s especially true of things having to do with this wall. On the campaign trail, he insisted that he would negotiate a way of getting Mexico to pay for the wall. Mexico has refused (of course) to pay for the wall ever since. When the Mexican president said as much in public, Trump was not happy and tried to cover the country’s position up so no one would know he was a big phony. Donald Trump is not as stupid as some of us would like to think he is. In San Diego, looking at prototypes of a border wall last month, Trump laid out some of his wishes for this $25 billion dollar wall. He wants a high wall, because he believes that Mexicans are “professional mountain climbers.” and one that border agents can see through. “You have to know what is on the other side of the wall. You can be two feet away from a criminal cartel and you don’t even know that they are there,” he said. “If you don’t have a wall system, we’re not going to have a country,” Trump added. Things are getting so dire when it comes to making good on this campaign promise for a big border wall, Trump is now asking the Pentagon to try to fork over some dough. He apparently met with Speaker of the House Paul Ryan, as reported by CNN, to see if they could rework the budget and find military dollars — you know, funds that go to the Department of Defense for actual, effective military personnel and equipment — to pay for the wall so he doesn’t look like a jerk in front of his supporters. However, to edit the budget you need every single member of Congress’ approval, and that’s not something that’s going to happen, especially after the 2018 midterm elections. 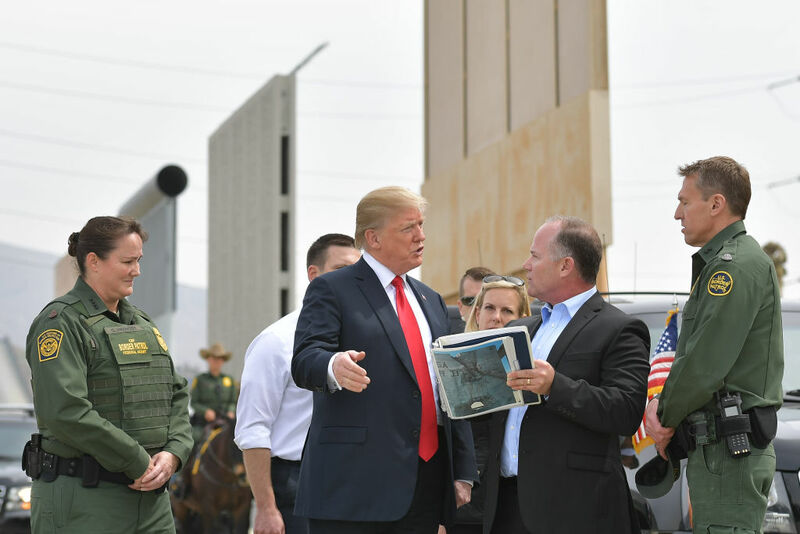 But know this: There is no new wall being built right now, and the pictures Trump posted was just a picture of Border Patrol replacing a makeshift metal scrap fence with another fence made of new materials. It’s no wonder Trump is always so cranky on Twitter — he made really dumb promises to his supporters that he can’t follow through on. But a president (or any adult) should just own up to the difficulty and come up with a new plan. There’s no need to lie, or lie so blatantly, to people.